1. DROP PROCEEDINGS AGAINST APOLINAR (“ABUELITO POLY”) SANCHEZ CORNEJO (A#070-926-234)! UPDATE: Abuelito has been RELEASED from detention due to community pressure!!! However, he is still in deportation proceedings. Please still sign and share the petition demanding that ICE drop the proceedings! This morning (September 23rd), ICE raided my grandparents’ house in Pico Rivera, CA and kidnapped my 67-year-old grandpa Apolinar (Abuelito Poly) Sanchez Cornejo (A#070-926-234). Today is one of the hardest days of my life. My name is Yadira Sanchez, and I’m an undocumented organizer who has fought for years against the criminalization of our gente and against the separation of families.​ Through my work with Improving Dreams Equity Access and Success (IDEAS), the Women’s Collective, Educators for Fair Consideration (E4FC), and the East Bay Immigrant Youth Coalition (EBIYC) and my degree from San Francisco State University in Political Science and Latin/a Studies, I have seen the way that the deportation machine tries to destroy our community. Abuelito has always been proud of my work and calls me “licenciada,” because he wants me to become a lawyer to fight for our community. While he only had the opportunity to go to elementary school, he’s an incredibly smart person with a passion for history and math. He and my Abuela Vicky have been married for 44 years and have lived in the U.S. since 1992. They have three sons, seven grandchildren, and no immediate family in Mexico. Every day, Abuelito still works as a mechanic in Montebello, CA to support my grandma. He is the pillar of our family and my grandparents need each other. In the 90s, he was the victim of a fraudulent lawyer which resulted in him getting a deportation order without knowing it. Because of his citizen son, a lack of criminal record, and his length of time here, he would qualify for President Obama’s Deferred Action for Parents (DAPA) program. Abuelito does not fall into ANY of ICE’s enforcement priorities. My family had a harsh awakening when Abuelito Poly became part of the statistic of 34,000 people that ICE tries to detain every day. He is the perfect example of how ICE lies constantly and doesn’t even follow its own rules. When we say not one more deportation and not one more family separation, we mean it! Please sign and share the petition and tell ICE to #FreeAbuelito now! Thank you for your support! The morning of September 23rd, ICE raided the home of 67-year-old grandfather Apolinar ("Abuelito Poly") Sanchez Cornejo (A#070-926-234). 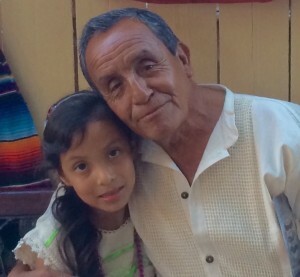 Abuelito Poly is a beloved father, husband, and grandfather. He and his wife Vicky have been married for 44 years and have lived in the U.S. since 1992. While he only had the opportunity to go to elementary school, he’s an incredibly smart person with a passion for history and math. Abuelito works as a mechanic in Montebello, CA. He is the pillar of his family, and he and his wife need each other. In the 90s, he was the victim of a fraudulent lawyer which resulted in him getting a deportation order without knowing it. Because of his citizen son, a lack of criminal record, and his length of time here, he would qualify for President Obama’s Deferred Action for Parents (DAPA) program. Abuelito does not fall into ANY of ICE’s enforcement priorities, so why was he targeted and detained? ICE must drop removal proceedings against him immediately. Thank you. 2. #FREE GERARDO: STOP ICE FROM DEPORTING PARALYZED TEEN! Recently, a number of civil rights groups submitted a complaint to the Department of Homeland Security around medical abuses and neglect against people with disabilities in the for-profit Adelanto immigration detention center run by the infamous GEO Group in the Mojave Desert of Southern California. As detailed in the complaint, people in Adelanto are regularly denied necessary medical treatment, are shackled during appointments with psychiatrists, and two men have even died in recent years. Yet, ICE continues to detain people with serious disabilities and asylum seekers at Adelanto, despite the extremely real danger to their physical and mental health. In response to these concerns Community Initiatives for Visiting Immigrants in Confinement (CIVIC), Immigrant Youth Coalition (IYC), National Day Laborer Organizing Network (NDLON), and RAIZ have launched a campaign to demand the immediate release of four people detained in Adelanto with disabilities and asylum seekers. Gerardo Corrales (A#205-464-990) is a 19 year old son and brother from Seaside, CA who has lived in the U.S. since he was 2. Gerardo is paraplegic and uses a wheelchair. He became paralyzed after being the victim of a random shooting one year ago a few weeks before his high school graduation and was still early in his recovery when local police raided his family’s home. The police pointed their guns at Gerardo’s mother and 8 months pregnant sister and put Gerardo into a chokehold despite him being in a wheelchair while he called out that he could not breathe. He was arrested for possession of Xanax, an anti-anxiety medication, and handed over to ICE who sent him at Adelanto. Gerardo requires catheters and has been forced to reuse them by Adelanto staff, resulting in a serious infection and hospitalization. He depends entirely on other detained men to help him wash himself, use the bathroom, and change his clothes. His wheelchair has three major screws that hold it together and two have fallen out, putting him at risk of serious injury at any moment. Gerardo has a strong U Visa case from the shooting that left him paralyzed and must be released immediately so that his family can care for him and he can continue to heal and finish high school. He is a very smart, funny, and well-spoken young man. While he has a conviction from when he was very young resulting from being with friends who were in possession of guns, it should not result in him being medically abused in immigration detention or deported to a country where he has no family or support system. Subject: Release Gerardo Corrales now! We request that ICE and DHS immediately release and stop the deportation of paralyzed teenager Gerardo Corrales, whom ICE attempted to deport on the morning of October 7th. Gerardo Corrales (A# 205-464-990) is a 19 year old son and brother from Seaside, CA who has lived in the U.S. since he was 2. Gerardo is paraplegic and uses a wheelchair. He became paralyzed after being the victim of a random shooting one year ago a few weeks before his high school graduation and was still early in his recovery when local police raided his family’s home. The police pointed their guns at Gerardo’s mother and 8 months pregnant sister and put Gerardo into a chokehold despite him being in a wheelchair while he called out that he could not breathe. He was arrested for possession of Xanax, an anti-anxiety medication, and handed over to ICE who sent him at Adelanto. Gerardo requires catheters and has been forced to reuse them by Adelanto staff, resulting in a serious infection and hospitalization. He depends entirely on other detained men to help him wash himself, use the bathroom, and change his clothes. His wheelchair has three major screws that hold it together and two have fallen out, putting him at risk of serious injury at any moment. Gerardo has a strong U Visa case from the shooting that left him paralyzed and must be released immediately so that his family can care for him and he can continue to heal and finish high school.